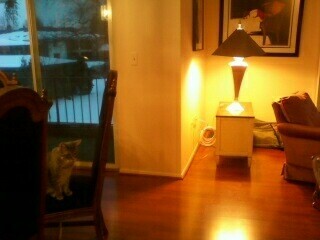 Cat Chat With Caren And Cody: Our Flooring Is Almost Done And We're "Floored!!" Our Flooring Is Almost Done And We're "Floored!!" Hi Everyone! Cody here with an update on the flooring. It's almost entirely in and my Mom is handling it like a little trooper. The men that are putting our gorgeous Pergo floors in are super nice and boy do they ever work hard! (Don't they know it is much nicer just to eat and nap all day?) My Mom said they made it so easy for her because they were so nice and even cleaned up their mess before they left. I couldn't believe it when they opened the door and look what I saw!! See me on the chair? They didn't even need me to "snoopervise!" Look at how it shines!!! is coming for me next week! A new couch will be here! Everything went so well that it totally surpassed my Mom's expectations. She is so thankful and just loves the great job the hardworking men have done so far, they only have a little bit left to do. Beautiful! I hate to say it but my eyes have turned a tad bit green! Oh yes, that green eyed monster is taking over my body, I have always wanted wood floors. Love the color you picked out. Have fun watching Dakota slide on the floor today! Wow I LOVE your new floor, it's beautiful! Brilliant and elegant, your place looks so comfortable! I bet your mommy is also happy with the end of the works. Looks wonderful :) Very "Good Housekeeping". The sound of the paws/claws will be hilarious - for a while! At least you'll hear them coming as they either clatter or screech to a halt lol. Wow... floors with a great slide factor... I'm sending the boys over to test them out. @Rumblepurr ohhhh yess they are! Grab your toys and come on over! @ALittleSprite thank you! We are so happy you love yours too! Nope the nice men moved almost everything back! @Luna ahhhhh you are so sweet thank you!! We are sooo happy with it! My goal was to make it warm and inviting, when the furniture comes I hope I succeeded! You have a great weekend too and thank you! Terrific!!! It's so beautiful, Cody! I like your new flooring a lot and I love your living room. Gosh!!! It looks so comfy. Your mom is so right about Dakota wearing tap shoes. Eva is wearing her tap shoes all the time at home and I know exactly where she is once she is on my wooden floor. She can't hide from me and fool me at all, LOL! I'm so glad that your flooring is almost done and you will get back 100% attention from your mom before you know it. It's beautiful, can't wait to see the new furniture. It's gorgeous! I love it, love it, love it! Well worth it, no question. Your floors is beautiful! Me misses our floors. They is so much more fun when playing hockey with crunchies and flinging toys! 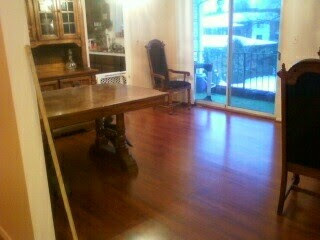 Thanks yous for showing us your beautiful floors and we can't wait to see the new furniture! I love wood floors with light painted walls. It looks fantastic, very 'clean' and sophisticated. And I love Carolyn's comment. My parent's cats always click in their living room. I think it's a wonderful sound. It always makes me laugh. Wow, those are beautiful floors! You will have fun slipping and sliding on them for sure. @The Whiskeratti thank you!! Ohhhhh yesss we are having fun sliding! @Nellie ohhh yes and it was sooo funny yesterday! My Mommy was using a big sweepy thingy on the floor and she started teasing Dakota with it, running it on the floor chasing him. He tried to attack it! MOL! @Linda B. thank you sooo much! I will show photos of the new furniture for sure! @Priscilla, I am stuck in the bedroom again. Dakota is in the kitchen with Mommy and Daddy right now. They said Dakota has been a really good boy through this. My Mom likes what you like, she can hear Dakota's feet "clicking" and she knows exactly what he is doing and where he is! She wants everything to be warm and cozy and I think my new bed, er couch, will be the icing on the cake! Thanks so much, we love it! @jen thank you! You think like me lol! I was staring at them last night already looking for dust! I will try and mop them every day! The floor is beautiful! And we're glad to know the floor guys did such a great job, so fast. Just so you know, doggies aren't the only ones that can slip-slide on floors like that. Just sayin'! Beautiful floors and sounds like all is going well with it. Oh, Cody, my grand-kitty too went sliding as he was running from one end of the house to another. It was entertaining. I miss him since he went home with his mom. Tell your mom the floor is gorgeous. Can you see your reflection in that new shininess? 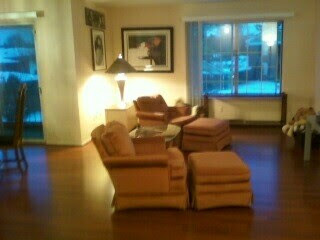 What a lovely new floor, plus a new couch, you guys will be livin' in high style! We think that flooring looks snazzy! And we would like to see a video of the kitties sliding across the new floor. Cody, The New Floor look AWESOME !!!!! That light up the whole room beautiful !!!! That floor is gorgeous! I BET that is fun to slide on!!!! Your floor looks lovely. You will have a great time sliding on it. Pergo is terrific flooring material. Just don't get it too wet or you'll have issues with the seams in between the planks pulling up. Just use a slightly damp cloth or a swiffer and you'll be fine. We had them for years at our previous house and loved them. Wow! I really like that floor! *sigh* Someday! We have tile in every stinking room, cold, cold, cold. Color me jealous. @Old Kitty thank you!!! I just love it and I think Cody and Dakota do too!! I love how shiny it is too, now cleaning it is going to be soooo much fun lol! Hugs to you and Charlie! @Vicky that is what I hear. It is supposed to be super easy. Yep they told me about not getting it too wet and I am so paranoid! I am so glad you had them and loved them too! Thanks for the tips! @Eric and Flynn THANK YOU! Oh yesss the boys are having fun slipping and sliding. Actually Dakota is sliding way more than Cody! @Amin thanks so much! I love wood floors too, I think they are so pretty! @Sparkle, thank you!!! I am beyond in love with it! I hope I fall in love with the cleaning of it lol. Dakota is sliding but he is getting the hang of it. It is a blast to watch lol. @Stacy and Ellie THANK YOU! OMG yes!!! I am hoping that maybe this will help with Cody's allergies somewhat. He won't have all the dust and things from the ancient carpet. @Hilary thank you!!! We are beyond tickled with them! @Mumsy thank you!! We will show you the couch for sure! Thanks so much! @Scrappy Grams awwww I am so sorry your little grand kitty has left. How are the plans coming along for you to get one of your own? Good question about the reflection, I will have to check that out! I can't wait for you to get a kitty of your very own! Thanks so much! @Admiral Hestorb, thank you!! We are thrilled! @Mason thank you! I am so tickled with them! I cannot get over the difference they make! What a great feeling it best be to get a new floor under those paws...I can't blame your mama for being so happy with everything either. Can't wait to see the new furniture either. It looks like you have a brand new house! Have fun sliding! @Dori ohhhh yes and my Mom LOVES it under HER paws too! We will show it when it is done for sure! Your new floors are gorgeous! Congratulations! Floors looking good! It looks like the same type we have - we got it to replace the horrible brown tiles that were in the house when we moved here - everything was brown then haha. The new floors look awesome. So much nicer than carpeting. Wow, your place is really getting a makeover. Wowza! That really looks like a ton of fun! I want to teleport over and check it out. I could really get a good slide going on **that**! Cody, we have tiles at home, no wood. Mama is lazy cleaning the floor sometimes but we're not complaining. Ehem....any floor warming party? purrr....meow! The room looks beautiful, Cody! Did your mommy buy you some kitty socks yet? Be sure to mew her ear off until she crumbles to your constant begging. Maybe, you can talk her into getting Dakota some doggie socks then you both can pretend to be ice skating across the floor. Well...I did see the snow through the big window and at least you can keep cozy warm indoors as you pretend to be on a frozen pond. Have a fab..catulous weekend! @Cathy thank you!! Nope! No kitty socks for me cause my claws aren't clicking on the floor. She joked about getting doggie socks for my brother though! Ohhh I mewed and mewed yesterday when she had me locked in the bedroom and then the BATHROOM while the men finished yesterday. But it didn't work. Frozen pond! I love it! You have great weekend too! @Cat-In-Sydney I like tiles too! Especially where you live I think tile floors are great! Mom cleaned ours yesterday, I think she will be cleaning it EVERY DAY! Hmmm...we should have a floor warming party! @Au and Target, we haven't played slidey games yet but I am sure we will! Thank you!!! Thank you to everyone! My Mom just got up and is typing for me and we are tired! @Jan omg it is but EVERYTHING had been the original from the 70s. My husband bought the condo in 2000 and we had done NOTHING and I mean NOTHING til now. Things should have been done YEARS ago but we couldn't. @Diane thank you! We agree! We love it!! Hoping it will help with Cody's allergies too! @Natalie thanks soooo much! We love it!!!!! Have a great weekend everyone and thanks sooooo much! Still a lot of work to do putting so many things back and one more wall has to be painted in the dining room on Monday. WOW! 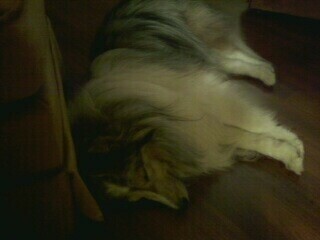 No wonder you Mom is happy Cody, the floors look beautiful, we could have those furred in no time. Dakota looks totally happy too! Wow! Caron that looks so posh! They look lovely. And don't worry about doing anything too athletic Cody, you'll find the events for catalympics are very liberal! Hope you'll play. @wockley "posh!!" Hardly a word to describe me, but wait! Ohhhh the FLOORS! lol. I love them, I am just tickled! Thank you! @Fin thanks so much! I probably will try to play once I read about how we do it! The floors are beautiful plus the fact that theinstallers were hard working and nice makes your project even more perfect. Can't wait to see the new couch. Oh Code, the floor sure looks great! Those super nice men did a wonderful job. Sliding on this new floor must be so much fun. One of my boys, Goro loves to run and slide on a wooden floor. But it is a very small space, I wish we could have a large, shiny wooden floor like yours! Wow! Wat a pawsome, shiny, tap-dancy floor you haf! We fink dat all you need is a giant-size cat tree in the hall and you'll be in paradise. @Slash & Bronzy, "tap-dancy floor" lmao! I love that! Ohhhh yes a giant size cat tree would be just the ticket! Thank you! @cherie you are right, thanks so much! The workers were fabulous! That is one nice looking floor. Though I find it hard to believe that it could get done without your snoopervising. I think it was better for you to be away from all that noise while the work was being done. Tell your folks they did a good job! Great floors! Bet we could get some great hockey games going at your house now. @Laila and Minchie thank you!! Oh yeah hockey would be a blast! Love love love your new floor! Looks like Cody and Dakota enjoy them too!